Well, I really pulled out the stops for this year's Easter lunch! 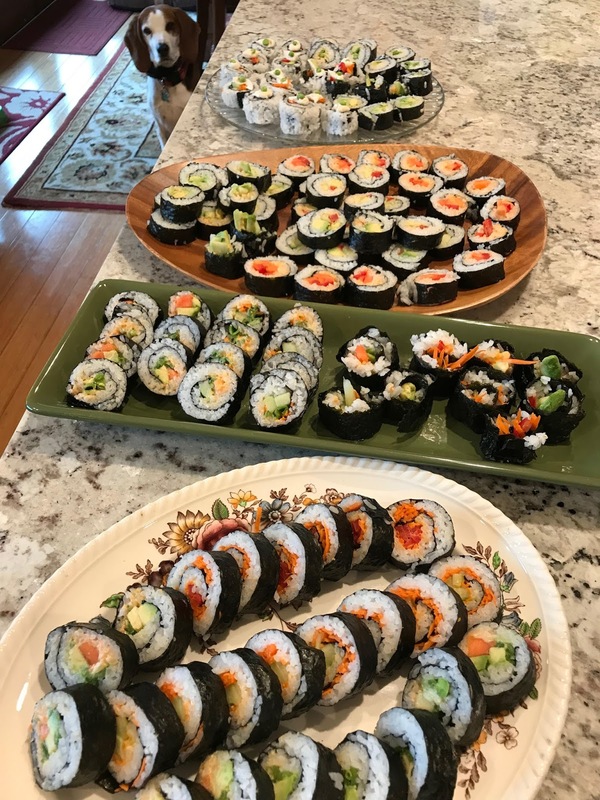 I made tons of vegan sushi; I literally spent hours prepping veggies, cooling rice, rolling, rolling, rolling, and decorating. See how gorgeous my end result was! I'm telling you, I was mighty proud of these beauties. Look at them! The only horror was that I did not realize how yucky they would be after storing them over night in the fridge :( I mean, they were hard and crunchy and the nori was chewy. My family (bless their hearts) ate like champs, but all I could think of was how much they were chewing and chewing and trying not to frown at the Easter table. My beautiful sushi did not satisfy at all. I knew we were hungry and cranky. So the next day, I made three power salads, enough to fill us to the brim and beyond. Today I share an excellent recipe from Budget Bytes. See the original recipe here. This stuff was amazing. In fact, it's probably my new favorite way to eat cauliflower. Many kudos to Beth and Budget Bytes.